Happy Star Wars Day indeed, Chewie old pal! 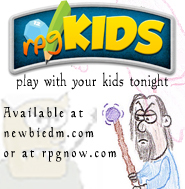 The only two RPG games I’ve ever played have been D&D and the Star Wars RPG. Shocking, I know. But those games have been all I’ve ever needed to satisfy my gaming need. D&D for the fantasy, SW for the Sci-Fi, it’s that simple. Now, I’m not talking about the crappy D&D-in-space-d20-nonsense released by Wizards of the Coast, that’s not the SW RPG to me. Not by a long shot. I’m talking about the game that helped spawn a Star Wars renaissance in the early 90’s, the game that authors like Timothy Zahn turned to when they wanted in-universe questions answered, and the game that introduced us to a Squib named Mace Windu before there was a cinematic Mace Windu. ( I promise I’ll get to him later.) 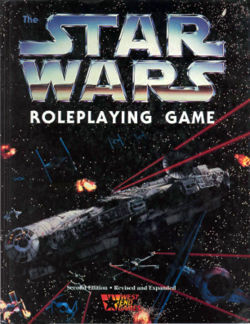 I’m talking about the masterpiece that is West End Games D6 Star Wars The Roleplaying Game. I won’t go as far as describing the 1st Ed. of the game, because it predates me. I picked up the game after the launch of 2nd Ed., in 1992 or so. What made this game so special to me? Well, many things. D&D had (and always will have) its sacred cows like the fighter, cleric and thief, while the D6 game left the door wide open to any type of character you could think of. Class-less playing. I loved it, it was a breath of fresh air. You wanted to play a force sensitive smuggler? Check. An Ewok? Check. A droid? Check. It was a wide open door to the SW universe where any type of character was possible as long as you could imagine it. It was also a game that although represented a licensed setting, didn’t feel like you were restricted or otherwise forced into a square peg. 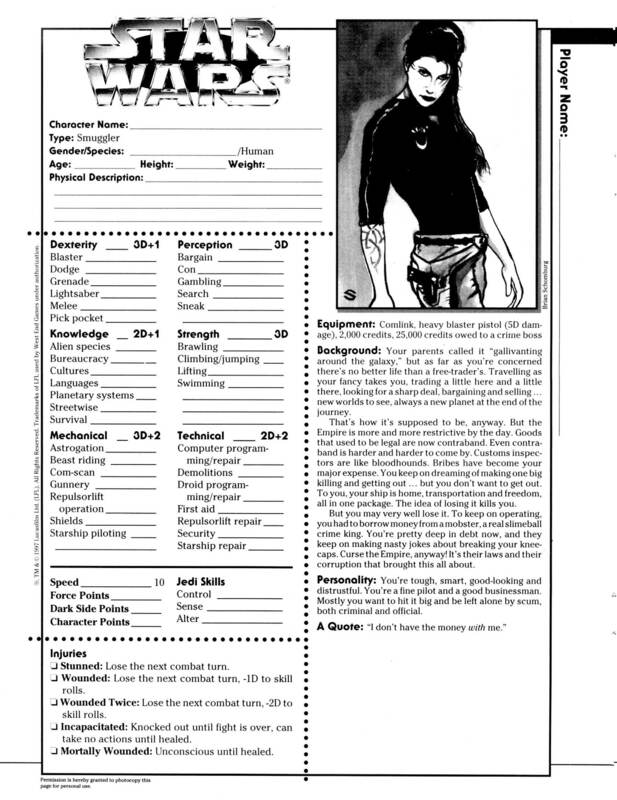 With the plethora of supplemental material released through its “Galaxy Guides” expansions, the game offered a different corner of the universe for every type of player or party. You could play an entire campaign without once hearing mention of the Rebel Alliance or the Empire if you wanted. For example, Galaxy Guide 6, “Tramp Freighters” was all about ships like the Millenium Falcon, smuggling vessels working the shipping lanes for slimy loan sharks. 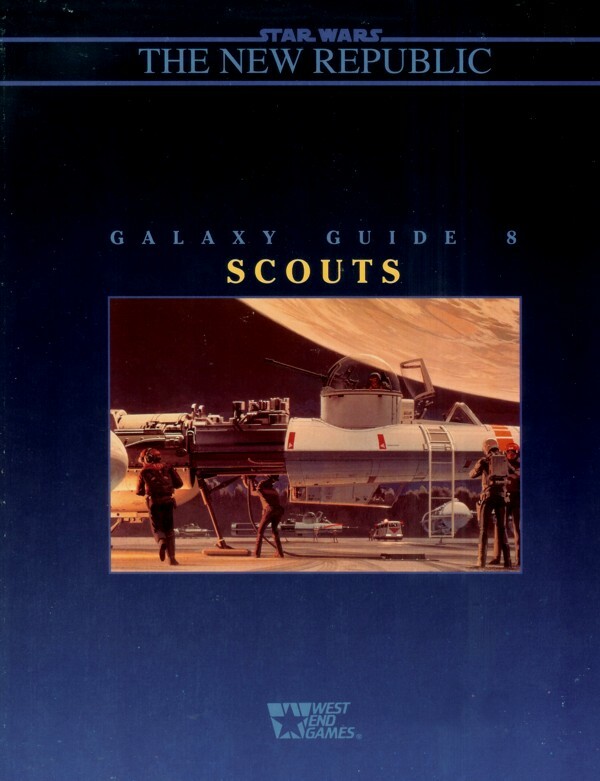 Galaxy Guide 8, on the other hand, was dedicated to “Scouts”, the men and women out in unexplored space searching out new planets and civilizations to being into the fold of the Republic. There was truly something for everyone. The Galaxy Guides had awesome LucasFilm art on the covers. Character creation was simple. Let’s say you wanted to play a human. You started with 18d worth of attribute dice, which you had to split amongst the 6 attributes. These were Dexterity, Knowledge, Mechanical, Perception, Strength, and Technical. Each attribute had a minimum requirement of 2d and a maximum of 4d for you to split amongst them. So, you could max out your Dex to 4d, then Knowledge can have 2d, 4d in Mechanical, and so on. You would then assign skills under those attributes, using that attributes 2d or 4d or whatever as your base ability with the skill, and you had an extra number of dice to add to your skills at creation. The system was flexible enough to create any type of character you wanted. The list of skills was large, and it was easy to create new skills you felt your character should have. I can’t stress it enough, this game is fun. It’s fun to DM and fun to play. You can find the books on Ebay. If you go hunting, don’t get confused, there were a lot of books printed. All you need to start playing right away is the Second Edition Revised and Expanded book with the Millenium Falcon on the cover. It will easily give you enough material for several sessions worth of gaming. After you’ve gotten your feet wet a little, pick up the Galaxy Guides. There is a forum called The Rancor Pit where a dedicated group of fans have kept this game alive through fan made sourcebooks and material. Good stuff. Now, about Mace Windu. Mace Windu appeared in Galaxy Guide 7: Mos Eisley. 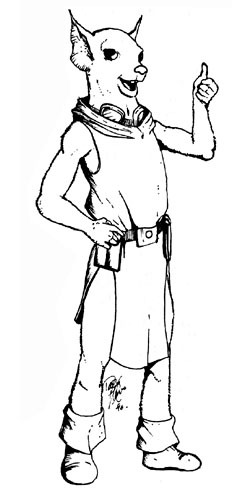 The book was dedicated to the iconic frontier town, and Mace was an NPC Squib, a member of a furry race dedicated to trading and scavanging wrecks and stuff. Apparently the name had been floating in the Lucasfilm vaults for some time and someone picked it up and applied it to this guy. So yes Virginia, there was a Mace Windu before Samuel J. If this article piqued your interest a little bit, I urge you to act on it. It’s a real shame that this game isn’t being played anymore with any regularity. Thanks for reading this lengthy diatribe, and may the force be with you. Oh, by the way, one of the main designers of the game’s original edition? Bill Slavicsek. OMG! I just picked up Star Wars RPG Saga Edition the other day. Looks pretty awesome. The D6 Star Wars system was very fun indeed, I loved the shoot from the hip fly by the seat of your pants feel of it. Star Wars D6 – Best. Star Wars. Game. Period. Dude, you have brought back memories. I still have my book for the d6. We should go old school one of these days. Star Wars D6 is great because it actually is really rules light. The game has a more free-form flow to it. Jedi are kind of like Wizards in the old versions of D&D. They start out kind of weak and become powerful in the end. There are some great rules for really making your ship awesome, and that is fun for most players. Overall, it is a great system that I hope gets brought back in some way, shape, or form.